zioxi | News | News | A grand opening indeed! zioxi were honoured to be invited back to Seymour Park Community Primary School for the Grand Opening of their new Digital Hub, designed and installed by zioxi and officially opened by the Mayor of Trafford. 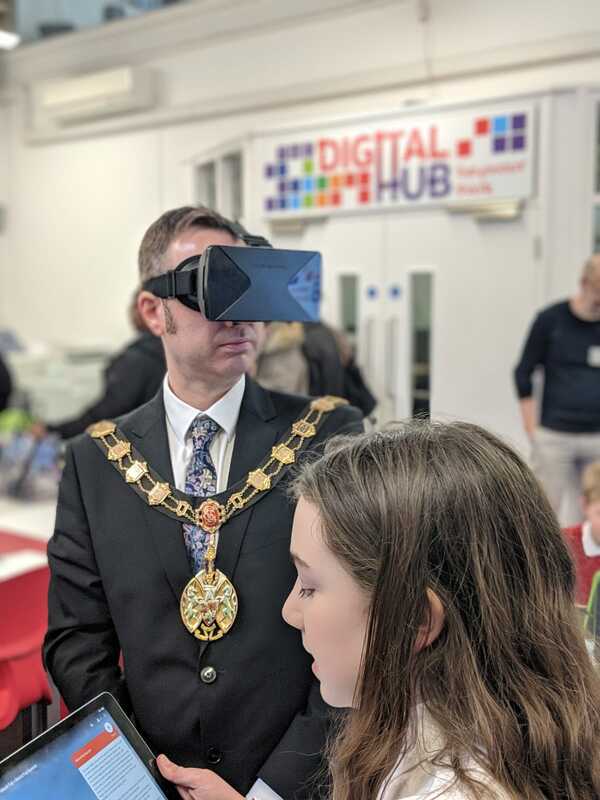 The staff and students at Seymour Park showcased for their guests – parents, governors, zioxi staff and the Mayor – just how fantastically well they had been using their new space, with groups of pupils coaching the visitors about a range of subjects including how to learn through VR, green screens and educational tech resources as well as building apps and demonstrating how to stay safe online. The hideaway zioxi P1 desks came in very handy when the year 1 pupils wanted to hide the monitors to show how to use Cody the coding Caterpillar and the acoustic pod was a great space to record audio for the green screen videos we were recording! It was a real joy to see the furniture and room being used so effectively to enhance teaching and to see such a vibrant, active learning space – thank you Seymour Park for having us work on this amazing project with you!